Season 10 of CNN’s Anthony Bourdain: Parts Unknown whisks armchair travelers off to remote places like Lagos and Singapore and explores domains closer to home, cities like Seattle and Pittsburg. 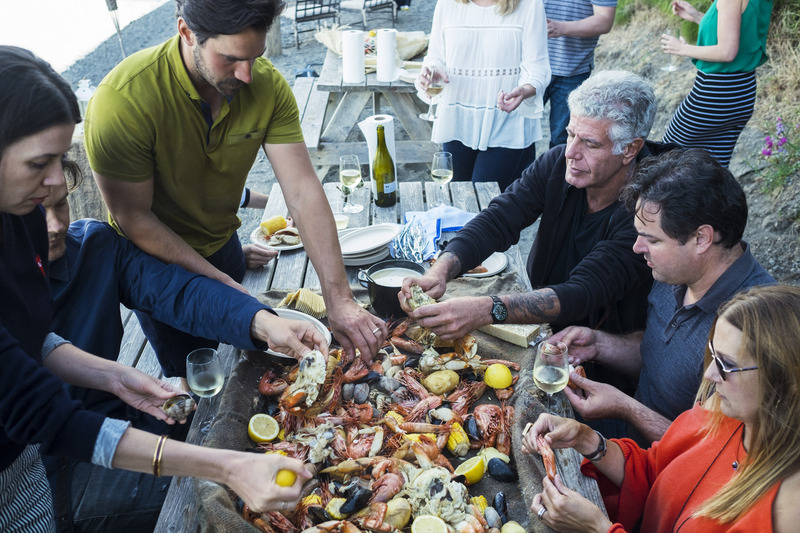 No matter how familiar or foreign the country and culture, Bourdain brought people together over things we can all share — a meal and a laugh or two. While this long-running series is physically unable to delight the taste buds, it has never ceased to be a feast for the eyes and ears. It’s won five Emmy awards and earned over 30 Emmy nominations, for everything from writing, cinematography, and picture editing to sound editing and mixing. The latter two areas are the responsibility of New York City’s String & Can. Re-recording mixers/sound effects editors Benny Mouthon, CAS and Brian Bracken have racked up 11 Emmy nominations on the show so far. 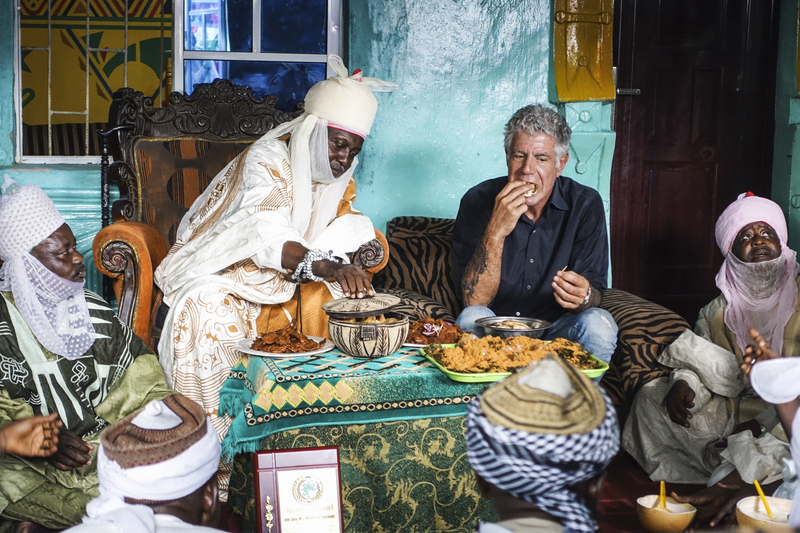 This year, Mouthon is in Emmy contention for ‘Outstanding Sound Mixing for a Nonfiction Program’ for his work on “Lagos,” and Bracken is in the running for ‘Outstanding Sound Editing for a Nonfiction Program’ for his work on “Seattle.” Here, Bracken and Mouthon share details on how sound was used to paint a vivid picture of the paths Bourdain has traveled. S&P: From a sound editing standpoint, how does Season 10 compare to Season 9? Brian Bracken (BB): As with every season, the picture editors set us up perfectly. In the case of the “Seattle” episode, the editor was Nick Brigden. He always brings it with his editing skills. Each episode has its own unique flair and it’s been consistent in that way; each episode can stand on its own. S&P: At the end of “Seattle,” people featured in the episode have a sing-along with Mark Lanegan’s song “Strange Religion.” What went into the sound editing there? BB: That was all cut in picture editorial. The production was synced to the track and the picture. In terms of mixing in the music, we only had very little hints of production where you can hear their voices pop through but it’s very subtle. There wasn’t much editing involved there. I just let the music play out with the production sound. S&P: What was the trickiest location in “Seattle,” in terms of sound editing? BB: I would say the slow-motion sequences. Those are always trickier than putting in footsteps of someone walking by. There was one montage in the middle of the episode when Bourdain and his guests were dining at Revel. The chef is frying a kimchi pancake in a skillet and it’s circling around in there before it’s flipped. There’s food put into the fryers and meat flipped on the grill. That was one of the trickier parts because the slow-motion sequences are tough. Using the example of the pancake sizzling and swirling in the pan, one way that I approach it is to just blanket that shot with one sizzle sound and not worry about the sync. Then I play it back at half-speed and ride my volume automation to accentuate where the pancake is in the pan. So the sizzle sounds dynamic but really the sound file is of one constant sizzling sound. When they chop food with knives, when they come down and pull the knife back, I like to add a little reverb to a sword sheath or knife sheath sound. The reverb tail adds a nice trail off into the next sound effect. So those are the sections where you can get more playful and more fun. Footsteps are just footsteps; you can’t really do anything fun with them. When you get to venture outside the box, that’s when you have the most fun. S&P: Of all the episodes you worked on in Season 10, why was “Seattle” a good choice for Emmy consideration for sound editing? BB: My sound effects work in this episode was grounded in reality, mostly texture-based. I wasn’t trying to get too fancy; I was trying to make it sound as real as possible. As far as the restaurant backgrounds, I cut around the dialogue to clean that up as much as possible and then used a stereo crowd or stereo restaurant ambience to widen the stereo spectrum. Also, I add in a layer of mono sound of a different restaurant to marry the dialogue and the stereo ambience together. S&P: For the crowd ambiences, was that all recorded material from that location? Or, did you enhance the location recordings with library sounds? BB: I’d say it was fifty-fifty. Anything slow-motion is designed. Anything silent that I see happening across the room — sounds that the mic wouldn’t pick up, I’m going to hit that with sound. If I don’t like the production sound or the quality of it, or if there’s someone talking too loudly in the background, I’ll switch that out. I want the dialogue to come across as cleanly as possible, so I’ll swap out anything that’s distracting and that’s why it’s fifty-fifty. That’s why I’m not using production sound more prominently. S&P: Let’s look at “Lagos.” This episode uses incredible sound collages, which are a mix of music and effects. How were those created? Benny Mouthon (BM): Overall, the “Lagos” episode was the opposite of Brian’s [Bracken] episode. He tried to make “Seattle” sound as real as possible but “Lagos” was more like an interpretation of the city. They shot a lot of footage on Super 16 cameras, as opposed to shooting everything in HD and having it affected afterward. They wanted to go for a different, more real style. In terms of sound, the bulk of what I had to work with on “Lagos” was put together by picture editor Hunter Gross, who tried whenever possible to use the production sound. His style of editing is playful; he likes to shake up the edit quite a lot. That’s evident in his past episodes as well. He will take production sounds that are happening — for example, in act two, after Computer Village, there is a group of people with wooden poles pounding yams in a large pot on the ground, so he syncs up that sound and syncopates that rhythmically and makes a little song out of it by adding tech sounds and beeps from the Computer Village shots before, bringing in the music that takes us through the rest of the scene. By the time I got the episode, it was very much “composed” by Hunter. My job was to amplify what was already there by filling in some stereo effects instead of mono ones, for example, and mix it all together. The challenge there was making the enormous sound collages fit into the CNN broadcast specs. S&P: Mix-wise, what was your goal for these sound collages? How did you get them to fit into CNN broadcast spec while also keeping them dynamic and interesting? BM: It was a two-pronged approach. The first problem was that there was a lot of material there; the show is fast-paced, very thick and very layered. At the same time, they had a lot of production issues. When I asked the producer about it, he said that the Computer Village was particularly difficult. You can almost see how everyone’s day-to-day hustle is represented in how the electricity poles are completely overwhelmed with cables taking whatever they can of the electric grid. The interference on the radio mics there was so bad that there were many scenes where I just had to use different mics than Tony’s [Bourdain] lavalier. There was a lot of material in there from Hunter already, and my first pass was spent just cleaning up dialogue so I could weave the layers of production and sound effects around it. 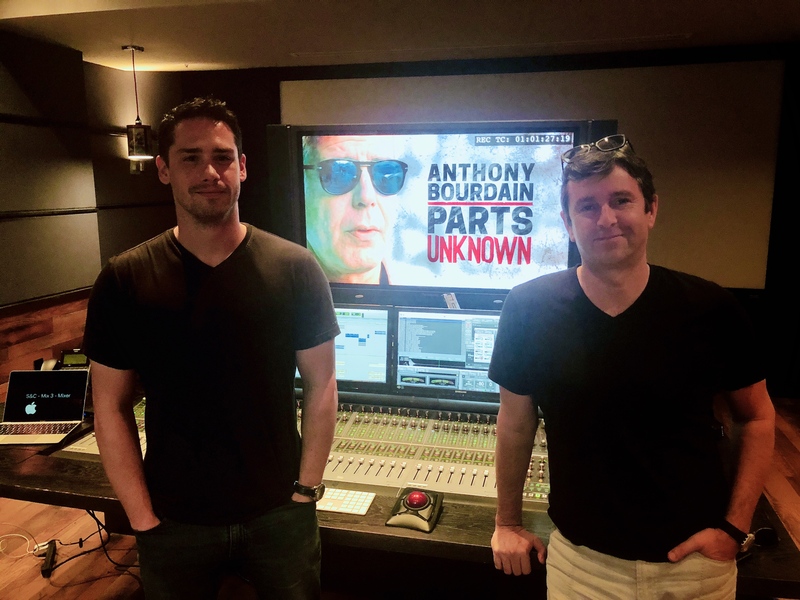 On Parts Unknown, we’re as much sound editors as re-recording mixers, and have to complete a whole episode in three days! The secret weapon here for me is still iZotope RX’s Dialogue Isolate, which is invaluable in just about every single program I work on, but especially the ones that don’t have a constant location sound recordist. In order to make it fit into broadcast spec, I sometimes had to remove bass-heavy moments when there was voice content just because it took up too much of the dynamic spectrum. S&P: For the Victoria Island sequence, the sound collage there is an interesting mix of coins, cars, and slow-motion smoke, drink pours, and hand claps. Did you help in creating the slow-motion sound effect? BM: There was very little in there that came from a sound effects library. Most came from the production sound, and I enhanced it by adding more or different reverb than Hunter had used, and sometimes by adding wider stereo effects. S&P: That scene of opulence and abundance is juxtaposed to the quiet, desolate sound of Makoko. What did you want the audience to feel there, and how did you use sound to help achieve that? BM: As we move away from Victoria Island towards Makoko, it’s kind of like leaving high-tech sounds behind to enter a calmer, more organic side of Lagos. I was really struck by how everything is built upon water and so I added a lot of stereo waves as the boats are moving through the water. But once Tony is talking to the two guys and eating with them in their home, and they’re discussing what it is to be poor and how difficult it is for people to get out of poverty, I always felt that the best way to go was to keep things simple, to help make a dramatic contrast with the previous scene. It’s a difficult conversation to have, and so I didn’t try to enhance it with too much added material. I just wanted the production sound to speak for itself. S&P: Why do you feel “Lagos” was a good choice for Emmy consideration for sound mixing? BM: It was a very special episode, and from a mixing point of view, a difficult one. Tony was very invested in going to Lagos and it was also tricky because of the way that they tried to present many different facets of the place. Visually, they went with a different storytelling method and I think Hunter went absolutely above and beyond in representing that with audio. I hope I was able to keep the viewer’s attention on the dialogue and at the same time allow them to enjoy that amazing Afro-Beat music!